Why is Quell recalling the dual sensor (photoelectric and ionization) smoke alarm? As consumer safety is our priority, we are issuing a recall of a dual sensor (photoelectric and ionization) smoke alarm model. A yellow protective cap may have been left on one of the two smoke sensors inside affected products during the manufacturing process. If present, it compromises the smoke alarm’s ability to detect smoke. The issue may affect dual sensor smoke alarms manufactured during the 13-month period between 10 September 2016 and 13 October 2017. Quell will replace all affected units for consumers free of charge. In Australia, the unit is no longer sold and will be replaced with a Worry Free Photoelectric Smoke Alarm with a 10 Year Battery; in New Zealand, it will be replaced with the same model. How can I find out if my smoke alarm is included in the recall? Australian consumers should view the Dual Sensor Identification Guide for detailed instructions on how to identify if their alarm is affected by the recall, how to receive an unaffected replacement unit free of charge, as well as other information. Or, consumers can contact Quell toll-free at 1800 654 435 from 8:30 a.m. to 5 p.m. AEST Monday through Friday, or e-mail us at quell-recall@chubb.com.au. If you are in New Zealand, please contact us toll free at 0800 248 220 (8.00 to 16.30 NZST, Monday to Friday) or e-mail us at sales@chubb.co.nz. Which smoke alarms are being recalled? 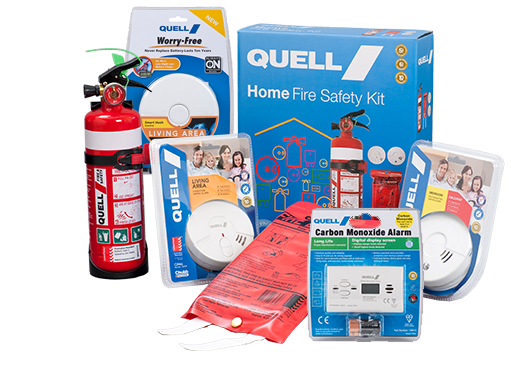 Quell has recalled one model of Quell Dual Sensor (photoelectric and ionization) Smoke Alarms – the QPI9010 (Part Number 130417) (DC/battery powered). Q. Do I have to have a smoke alarm in my home? Yes. All Australian homes must have at least one working smoke alarm installed on each level of the residence. New homes are required to have mains-powered alarms installed by a qualified electrician. Q. How often should I replace my smoke alarm batteries? Quell® recommends replacing smoke alarm batteries annually. We suggest picking an annual event—the beginning of daylight saving, for example—as your battery replacement day so that you don't forget. N.B. this does not apply to Quell's® Worry-Free range of alarms whose batteries have a 10-year lifespan. Q. How often should I replace my smoke alarm? Q. Why should I purchase a fire blanket? 42% of all residential fires in Australia start in the kitchen. A fire blanket is an effective way of extinguishing a stove-top fire before it gets out of control. Q. Do Quell® products satisfy Australian Standards? Yes. All Quell® products are subjected to rigorous internal testing and the submitted to Australian Standards for certification. Q. What can I do to prepare myself for a fire? Quell recommends implementing a fire escape plan that identifies the quickest and safest way out of the residence in the event of an emergency. In the event of a fire remember to, get down low and go, go, go. Q. Can I interconnect hard wire (AC) alarms with battery back-up (AC/DC) alarms? A maximum of 24 Quell Q1300 devices may be interconnected in a multiple station arrangement. Crossing line and neutral connections or line and interconnect connections will fatally damage all interconnected alarms invalidating the guarantee. All interconnected alarms must be powered off the same fuse/circuit breaker. Q. Will the alarm still sound if the power is out? Only alarms with a battery or battery back-up will sound if electrical power to the home has been lost. Q. Where should I install a CO alarm? CO gas can be anywhere and everywhere. CO gas is equal to or slightly lighter then air, and disperses evenly with the air in a room. Therefore, install a CO alarm where air circulation is best. Do not mount a CO alarm within 1 foot of the ceiling/wall intersection or other dead air spaces. For earliest warning of CO presence we recommend that you install at least one CO alarm on every separate living level of your home. Q. Where should I avoid installing a CO alarm? Avoid installing a CO alarm near bathrooms or in shower areas; in closets, crawlspaces, unused attics or unheated areas; within 5 feet of any fuel burning appliance; within one foot of any wall or corner; in rooms where chemicals or cleaning supplies are frequently used; directly above a sink, bathtub or basin; directly above or below air exchange or heating vents and behind drapes, furniture or appliances or in any other dead air space. Q. I've removed the Quell CO alarm and I still hear a beeping sound? If you have removed the Quell CO alarm and removed the batteries (if the model is equipped with batteries), the CO may still have a slight charge. To drain this charge, press and hold the test button for 10 seconds. If a beeping sound persists, there must be another device that is causing the beeping yet is less apparent than the CO alarm. Some such devices are a smoke alarm, a CO or smoke alarm in another location, or a cordless phone. Q. What might cause a Quell smoke/CO combo alarm to false alarm? Smoke alarms are sensitive devices that are designed to respond to small particles of combustion (smoke). However, since smoke alarms do respond to particles in the air, they are susceptible to triggering an alarm when encountering particles in the air other than smoke. Typically, a build up of dust or debris in a smoke alarm may eventually result in a false alarm. Additionally, if small insects enter or nest in the internal detection chamber, the smoke alarm will sound its alarm horn. This is mostly prevalent in the late night hours when insects are most active. To help keep dust, debris and nesting insects out of the smoke alarm it is recommended to clean the alarm at least a couple times a year with a powerful vacuum cleaner or a small can of compressed air. You should also avoid installation in areas where these types of particles are commonly present such as garages. Q. Why won't the Quell smoke/CO combination alarm silence when I press the test button to activate the false alarm control feature? If the Quell smoke alarm continues to alarm after attempting to activate the False Alarm Control™ feature, this means that there is too much smoke or CO present for this feature to activate. Remember, this feature does not "turn off" the Smoke/CO Combo alarm, but rather only reduces its sensitivity for a period of time.